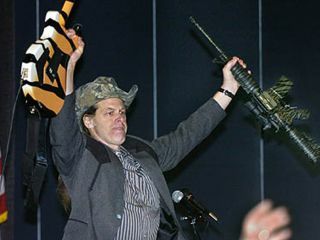 We've heard about life imitating art, but leave it to Terrible Ted Nugent to cross the line. On the set of the upcoming movie Beer For My Horses, in which he co-stars with country musician Toby Keith, The Nuge capped off a day's shooting with a real shooting. "Ted has just shot a guy with a bow and arrow," explained Keith. "And he's leaving the set to go back to his trailer, and all of Hollywood is standing around and a cotton tail jumps up - rabbit - and crosses the set. POW! And he guts him a rabbit right in front of everybody." The Beer For My Horses script was written by Keith, who also had a hit duet with Willie Nelson of the same name. The movie is described as a "fun-loving road trip movie" and also stars Nelson, Tom Skerritt and Gina Gershon. It's set to hit theaters August 8.